But before the book comes the author. Richard de Bury (1287-1345), also known as Richard Aungerville, was an old-school bookman in a literal sense. Born an Englishman, he lived in a time when actual knights roamed the land; when kings, queens, countries and the Church were roiled in violent turmoil; when the average life expectancy was about 32 years of age; and when all books were in manuscript form and the printing press was over one hundred years in the future. De Bury wrote the Philobiblon in Latin in 1345. Various early manuscripts exist that preserve this enthusiastic ode to books, book collecting, and librarianship. The work was first printed in Latin in Cologne in 1473. In 1832 the first edition in English was published in London with translation and notes by John B. Inglis. De Bury was by all accounts a sharp, witty, and capable man, one who rose to political power under Edward III and understood the tricky nuances of medieval politics where one wrong move could result in the loss of your head. He was also unabashedly a book hunter, using the leverage of his government positions to opportunize the gathering of books for his collection. He searched for them far and wide, in England and Europe, in humble backwaters and mighty metropolises of the time (Paris being his favorite), and among the general population and the elite. He would rather have books than money and let this be widely known, fostering a network of scouts. Once a book was acquired he read them and appreciated their contents. He was fastidious about their care and maintenance as well. All this and more he shares with us in the Philobiblon. De Bury, like many collectors who would follow, wished to immortalize and preserve his book collection by placing it in an institution of higher learning. He planned to establish a library at Durham College, Oxford with his books. However, he died in poverty after a lengthy illness, his dream unrealized, his funds exhausted, with a heavy debt remaining. His collection of approximately 1,500 volumes was dispersed soon after. Of his mighty library only two examples are known to have survived. Such are the travails of history. I am certain though he would feel a measure of consolation that his Philobiblon lives on today. Now to the thrilling book at hand with pun intended. 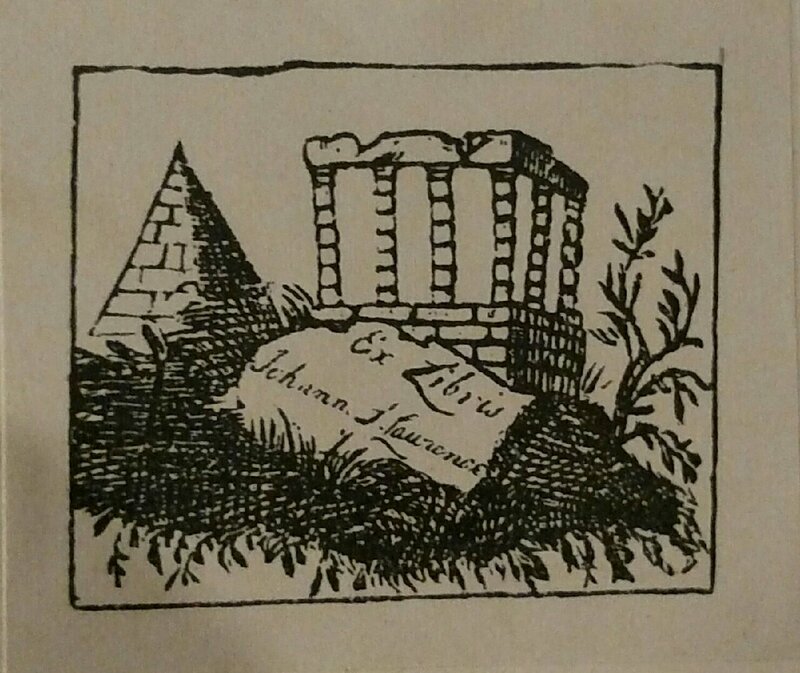 For our story shifts to an examination of Samuel Hand’s edition, revealing a forgotten American bibliophile worthy of resurrection. Hand in his preface to this first American edition explains that he considered doing a new translation of the work from the Latin but decided ”that of Inglis, which appeared in 1832, and though objected to by some critics as generally clumsy and in places spiritless, is on the whole honest and close to the sense of the original. . . Wherever it materially varies from it, I have endeavored to point out the discrepancy in the notes, and refer to the different reading of the original from which the translation is made.” Hand also draws heavily upon the notes and information found in the 1856 French edition edited by M. Chocheris. Hand writes, “Chocheris prefaced his edition with an introduction consisting of three distinct parts; biographical, bibliographical and critical. These prefaces, illustrated with notes, are all spirited, and exhibit much learning and research. Believing that they would add much to its value and interest, I have translated and prefixed them to this edition. The French translation itself was copiously annotated. Translations of all of these notes, believed to be important or interesting, have been made are to be found in the following pages. “That of the French edition has been adopted with a translation of the very full notes made by the French editor, exhibiting the various readings. The manuscripts and editions to which he had access and with which he collated it, are enumerated in the bibliographical preface. I have endeavored to follow that text carefully and accurately, and I believe few errors will be found. I had now become very much interested in Samuel Hand. I began to dig, both in print sources and by excavating large masses of virtual material, sifting through pages of online dross for shiny nuggets. And I found a few, enough to flesh out our subject and recover a forgotten American book collector. “Samuel Hand began collecting books even while striving to support his family in his law practice. His library, which grew to three thousand volumes, became one of the finest private collections in Albany, ‘the most complete and valuable’ in French literature. He was a ‘great collector of books; that was his great extravagance,’ an enthusiasm he demonstrated soon after he moved to Albany, when in 1861 he published. . . De Bury’s Philobiblon. . . .
Samuel Hand died a premature death from mouth cancer at age 53 at the height of his professional career and bibliophilic avocation. The exact fate of his general library is unknown to me as yet. 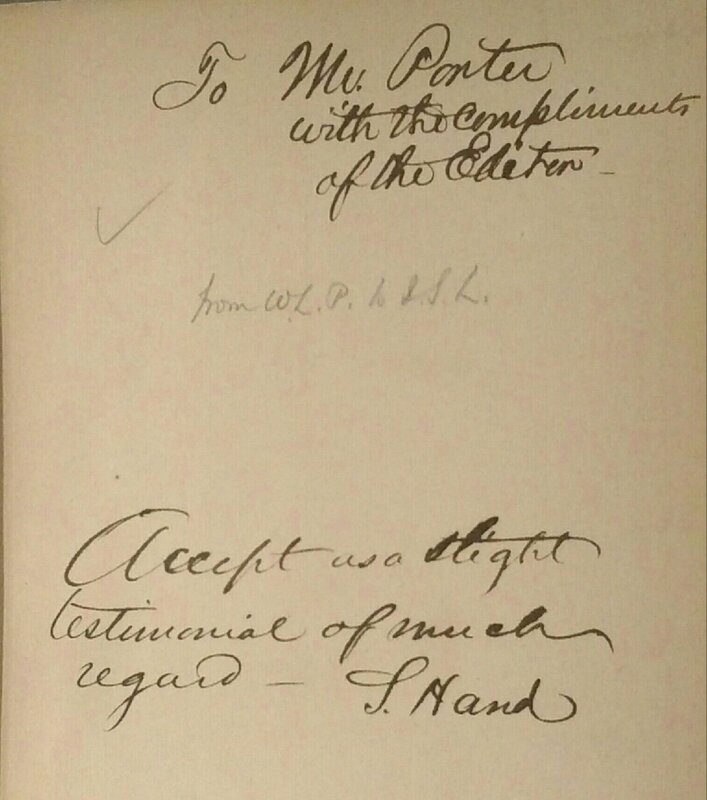 The Learned Hand papers record a gift in 1903 of 1,420 law books from Hand’s library to Harvard. The papers also record a gift of rare books in 1958-1959 to the New York Public Library. 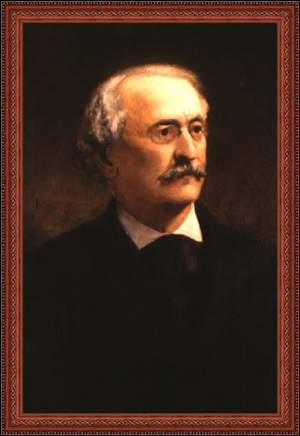 The recipient of Hand’s Philobiblon is almost certainly his law partner and mentor, John K. Porter (1819-1892), a prominent lawyer on the court of appeals most remembered for prosecuting President Garfield’s assassin Charles Guiteau. The book then passed to a relative of the Porter family, John Strachan Lawrence (1849-1924), Michigan attorney and politician. 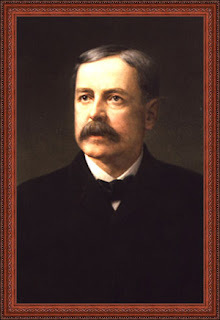 Lawrence was a member of the Grand Rapids Library Commission and president of the Grand Rapids Historical Association. He authored a family history Descendants of Moses and Sarah Kilham Porter (1911). 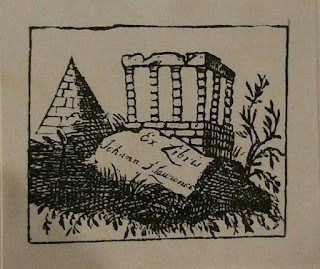 A search of Lawrence’s ex-libris in WorldCat revealed a handful of 17th and 18th century books in Latin including Elzevir editions and a 1721 book on astronomy by John Keill. I have found no other references to his collecting. There are numerous resources to consult if you'd like to read more about Richard de Bury. There are also a number of later editions in English of the Philobiblon that are more accurately translated and edited. A quick online search will get you started. This guy needn't worry. His given first name was Billings but he chose to go by his middle name Learned so the pressure to perform obviously didn't phase him. And he sounded cool. Fascinating. For further reading, I refer you to "Richard de Bury, Bishop of Durham. First Year Book of the DeBurians of Bangor, Maine" (Bangor: p.p., 1902). The author, Samuel Lane Boardman, gives further information about Samuel Hand and Munsell. Interestingly, Boardman believes that he introduced Munsell to the Philobiblon, and he credits Munsell with the impetus for bringing out the US edition. In the unfathomable circumstance that you do not yet own a copy, hie the to ABE at once, where there is a single copy available. 125 to have been printed, but apparently only 50 were bound.. I didn't know this about his grave and I'm jealous of your first-hand experience. I am aware of Samuel Boardman and the Deburians, however. I have Boardman's DESCRIPTIVE SKETCHES OF SIX PRIVATE LIBRARIES OF BANGOR, MAINE (1900), “Reprinted from the columns of The Bangor Daily Commercial, in an edition of Fifty Copies, for a few Booklovers, Friends and Libraries.” That's a rare one!